Ariel Hyatt is a percussive dance artist from Callander, Ontario. In 1999, Ariel began studying Ottawa Valley-style stepdance with Chad Wolfe of North Bay, Ontario. At 13 she entered the competition circuit and quickly distinguished herself as one of the youngest provincial and national champions ever to emerge. In 2006, her community held a ceremony naming her an ambassador and officially recognizing her achievements in stepdance. 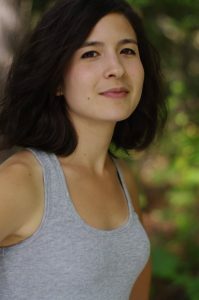 In 2009, Ariel began exploring improvisational tap dance to expand her rhythmic vocabulary and two years later, created her own unique fusion style, incorporating elements of Ottawa Valley stepdance, tap dance and world percussion, which she then showcased at events such as Summerfolk Music Festival in Owen Sound, Ontario, Celtic Colours on Cape Breton Island, Nova Scotia and Windsong Music Festival in Powassan, Ontario. Ariel has shared the stage with Shane Cook, Ashley MacIsaac and Yves Lambert, to name just a few. Ariel received two professional development grants from the Canada Council for the Arts in 2014 and 2015, which took her to Istanbul, Turkey where she studied Turkish percussion and continued working on her fusion of these percussive styles with her dancing. She continues to strive for development as an artist, seeking new ways to delve further into the rhythmic aspect of percussive dance.